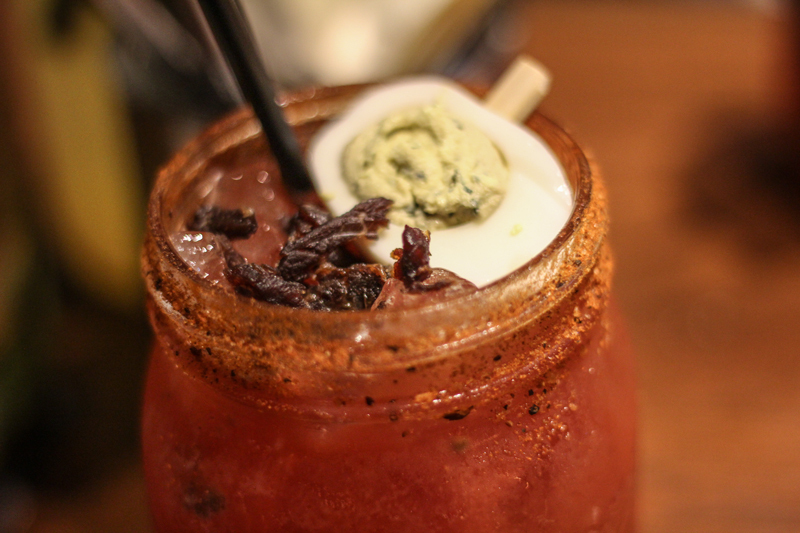 What Should You Drink at a Canadian Gastropub? It felt like it took all summer for The Birch Collective (TBC) to open. And it did. 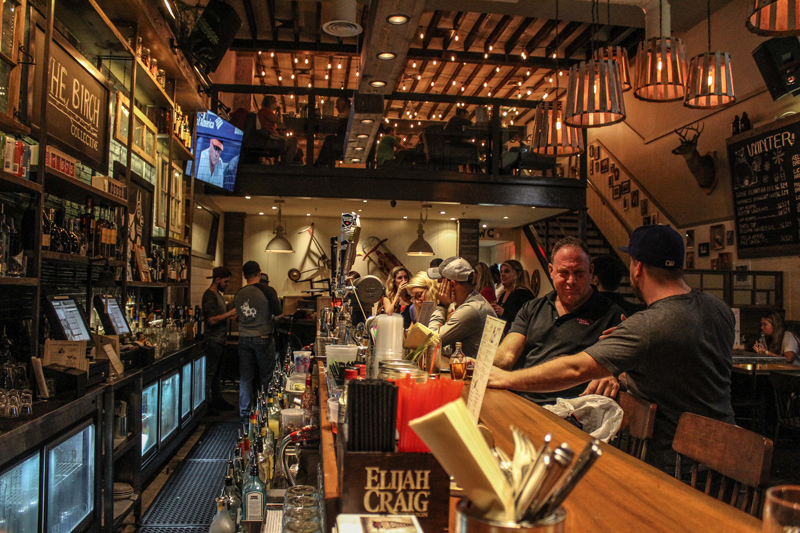 White Plains’ newest residents finally cracked their doors open in late August, and the months of delays likely just built up more anticipation for area bargoers because The Birch Collective is something new for Westchester. It’s a Québécois-style gastropub. So, what the heck does that mean?! The Birch Collective features a mashup of American classics and French-Canadian comfort food, so you’ll see artichoke dip on the menu, but you’ll also see things like a pork chop and beans plus a Montreal staple…poutine. We’re not here to talk about the food (not this time anyway) but it’s necessary when introducing The Birch Collective. You will, however, need something to wash down your gravy-covered, cheddar curd-laden, smoked brisket-topped fries with, and that’s where the drinks come in. The Birch Collective’s setting is really what sets the tone for its drink list. It’s fun, unpretentious, and extremely lively in a non-obnoxious way. The establishment is named after Quebec’s official tree, the birch, the symbol for new beginnings and making new memories. Their website hits the nail on the head with words like “welcoming” and “warm” when describing its environment. TBC’s owners, Matthew Gagnon Guastaferri, and director of operations Piërluc Dupont, were going for just that, a place where anyone could feel welcome, and that’s evident by the crowd that ranged from their early 20s to late 50s, some still sporting post-work business casual gear, the rest were jeans and T-shirt folks. When you plop down on a stool, and contribute to the smattering of chatter at the bar, and bob your head to ’80s and ’90s tunes bumping from the speakers, you should order something alcoholic. Their fun mixed drinks are called Birchtails, and you should start there. Created by bar manager/mixologist Samuel Trudeau, each one-liter beverage is inviting. Some are on the sweeter side, a few have herbaceous qualities, but most lie right in the middle of being not too sweet, but not too strong either. The best example of a middle-of-the-pack cocktail is the mojitos and margaritas. They’re well-balanced, not overly sweet, and like all the drinks at The Birch Collective, each includes one or more house-made syrups that you can really taste in layers. If you’re into rum or tequila, the mojitos and margaritas portion is a pick ’em, as it comes down to what flavors you like. Others may want something on the extreme-looking side of things. Finding Nemo is served in a bag you’d get a pet store goldfish in. Bombay Sapphire Gin, aloe juice, a blend of citrus juices, cucumber syrup, and Jones Bubblegum Soda are mixed and bagged, a straw gets inserted, then it’s zip tied, garnished with mint, powdered sugar, and a gummy shark. It’s sweet, but the cucumber comes through, and you’ll inevitably post it on Instagram. I certainly did! My favorite was the Montreal Mule, a twist on the Moscow Mule, using Elijah Craig Small Batch Bourbon and Rittenhouse Rye instead of vodka, with ginger ale and maple syrup. 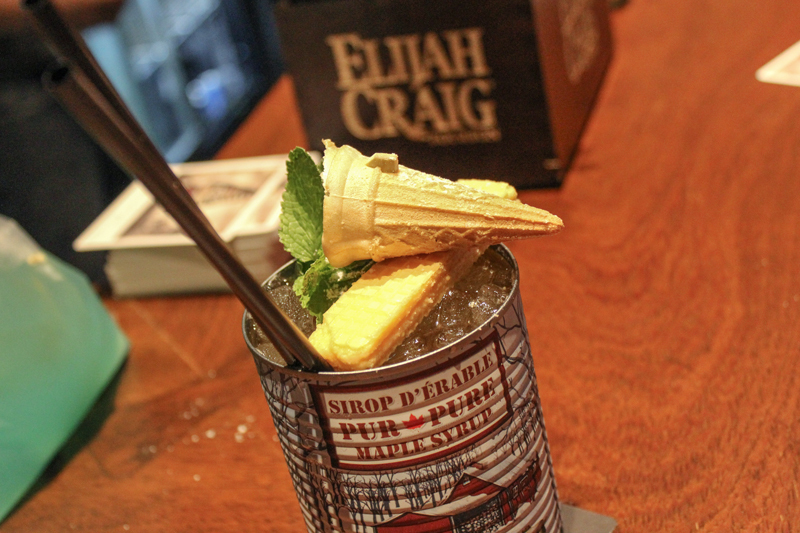 It’s strong, but balanced enough by the soda and sweet maple syrup, and served ice cold in a Canadian maple syrup can with a vanilla wafer cookie and a mini sugar cone garnish. I’ll also recommend that you try a mixed shot, namely the Dr. Birch (amaretto, cola, beer) that really does taste like Dr. Pepper. The only catch? You have to chug it Irish car bomb style. If you’re not feeling the cocktails, that’s cool, they’ve got wine available by the glass or bottle. For beer, a handful are from New York breweries, with some generic brands offered, but there’s a Canadian beer on tap — I previously have only seen it in bottles — that’s worth trying. La Fin Du Monde, brewed by Unibroue in Quebec, is a triple-ale and is highly rated on lots of beer review sites. Don’t let it’s 9% ABV stop you! It goes down smooth, with its bitter hop profile evened out with honey and fruit notes, and some spice from the coriander. The only downside? By the time this publishes, some of the drink options could be gone and switched out for fall flavors, and judging by a recent Instagram post, it looks like they’ve already started. Oh, well. Looks like I have more drinking to do!